Some photos of the Villa Escudero museum's displays sent in by Perry. These are from the private collection of the Escudero family. They made a museum to display their antiques and other collected items. Villa Escudero is an old hacienda in the Philippines turned rustic resort. WOW! incredible collection! would you happen to know if there are moro weapons in the collection? would love to see it. where is the hacienda btw? I don't remember if there were any moro weapons since it was 10 years ago when I was last there. I'm sure they'd have some though. 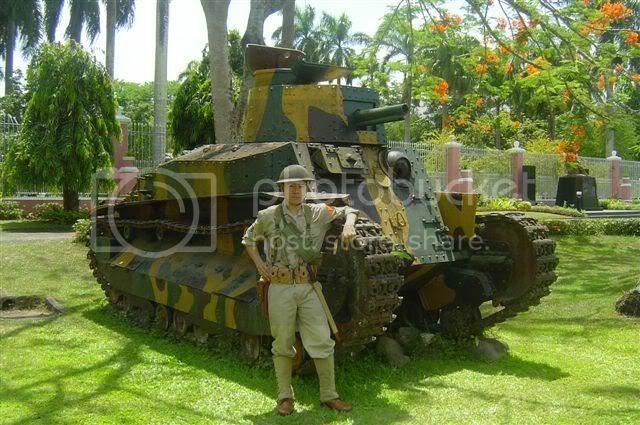 The collection includes a Japanese tank outside. This picture was taken in the garden. Oh... and WOW! They actually have a Johnson 1941 in there! (top right). 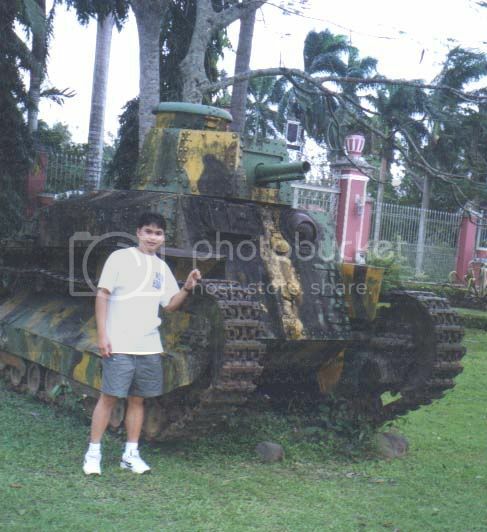 Now I am really curious to know if that was actually used during WWII in the Philippines! There are no records of its use in our islands, but it can be possible a Marine paratrooper could of found his way fighting all the way up to the Philippines. Interesting! It's past Tiaong... which is already Quezon province. The Johnson rifle was dug up on the property. 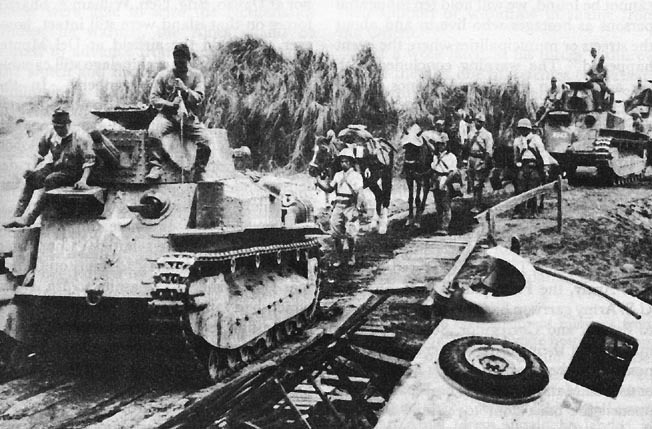 The 4th Marines (China) were in the Philippines before the attack on Pearl Harbor after they were evacuated from Shanghai. It is possible it may be one of theirs. I'll research on the serial no. if I can get it from the family. I had the chance to shoot the rifle twice. 1st time was after it was recovered, before we put it on display. Old WW2 ammo worked fine. When we used new AFP issue 30.06 it miss-fired. Failure to eject or short cycle. The new rounds had more smoke and lower recoil. These however worked with the M1 Grand that is gas operated. The same results the second time a few years later. Same results with the new AFP ammo, and no problems with WW2 issue ammo. We had to time this while they were cutting down some coconut trees with chain saws to cover the noise. Thanks for that info FL! WOW! That is some history right there! If you can, please post up more photos or send them to me through email. 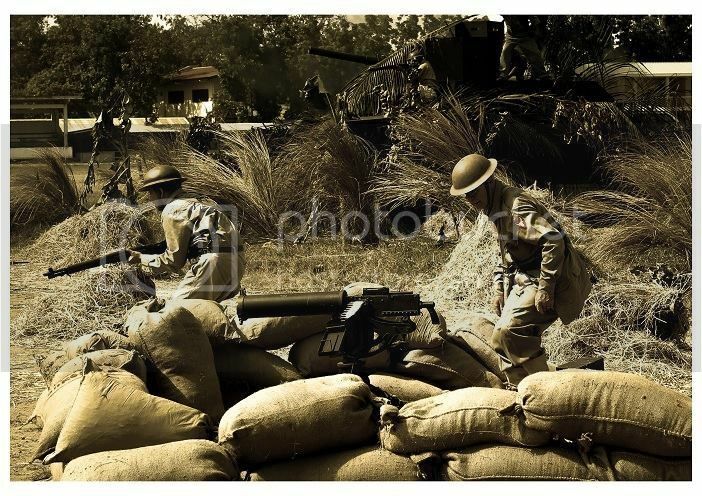 I also own a Johnson M1941 SAR. It sounds like the Escudero Johnson may have an out spec ejector. I am in touch with a guy who has all the extra parts needed for this rifle(he is the only one in the United States that has a stock of parts). He no longer has a website, but I have all his contact information as well as some of his price list. Right now my rifle shoots any type of 30.06 ammo flawlessly..my only issue is a worn out buffer spring(shoots brass 20ft). I love everything about the Johnson...its looks, engineering, history, mechanics and the brute force of the recoil; a true unique weapon ahead of its time...with its big buffer spring in the stock and lugged bolt, some say it is the grandfather to the AR15/M16. I am also on the Johnson forum...the son of Melvin Johnson and the authors of the book "Johnson Rifles and Machine Guns" are also on that forum. The only Johnson rifles that can be traced right now are the serial numbers with no letter prefix...mine is a B-series so it can not be traced until some one finds the rest of the missing files from the Johnson factory. If that Escudero Johnson is that old, then it more then likely is one of the first produced and has no letter prefix. You can find all the info on the rifle by posting up the serial number on the Johnson forum. Also, the operating handle looks different then any of the ones I have seen. Does the rifle have a working "bolt catch"?...I heard Marines actually removed this part. Any special markings? If you need any help, just let me know. I have all the manuals for the rifle, including Melvin Johnsons book "Automatic Arms" from 1942 which contains several fold out parts diagrams on all Johnson rifles. 2) A U.S. soldier brought one with him (possibly obtained "under the table") when the Philippines were liberated. I would also be interested to find out the "history" of this rifle.